The Canadian Hardwood Bureau held its fall meeting in Toronto. 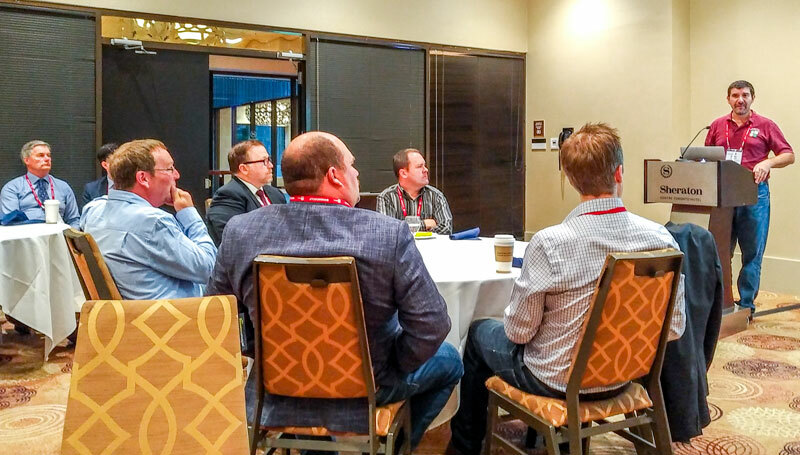 The Canadian Hardwood Bureau (CHB) fall meeting took place on Oct. 4, 2018 in Toronto, in conjunction with the NHLA Convention. More than 45 delegates participated, with Shaun Rowe of Huron Forest Products, the chairman of the CHB, presiding over the program. In his remarks, Rowe reviewed the Bureau’s finances, outlined the plans for upcoming grading courses and discussed future meetings. He also noted some unfortunate news recently; the loss of Don Odorizzi, Odorizzi Lumber, Golden Valley, Ont. and he extended best wishes to Richard Keeso and his family, following the tragic fire they had at their mill. The guest speaker was Henry Quesada, associate professor, Department of Sustainable Biomaterials, Virginia Tech, who works in the area of industrial engineering with specific interests in continuous improvement, supply chain management, international marketing, and organizational innovation. He talked about such issues as the main barriers and drivers for hardwood CLT, standards, raw material and supply chain considerations, machining, and research. There was discussion of the Canadian market and an opportunity for questions and answers. The next meeting of the Bureau is scheduled for March 19 - 20, 2019 in Montreal.